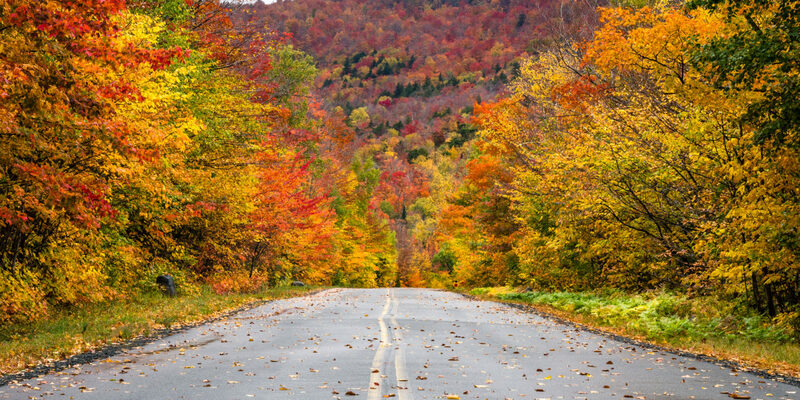 Ask any New Yorker to pick a favorite season and odds are good the answer will be fall. Temperatures are reasonable, apples are ripe for picking, the trees put on a show. 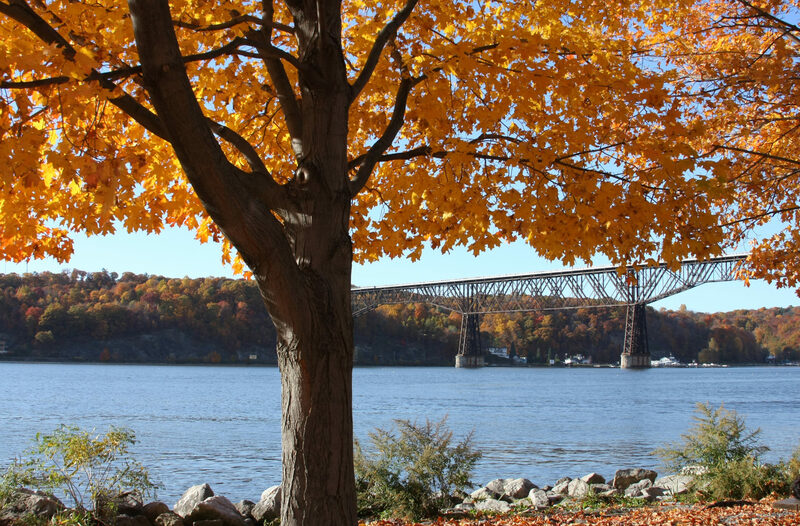 And while Central Parkis lovely in autumn, most locals try to escape the city at least once to take in the majestic scenery of the Hudson River Valley. You can make the drive yourself by car. But an easy Metro-North train ride from Midtown will put you in close proximity to plenty of scenic excursions. Here are a few of the best, starting with an easy stroll and working up to an intense hike. This structure opened in 1889 as the Poughkeepsie-Highland Railroad Bridge. In 2009 — reconstructed after a 1974 fire destroyed the tracks — it was reborn as the Walkway Over the Hudson State Historic Park. A bit more than a mile long, the ADA-compliant linear park boasts views up and down the Hudson River, north to the Catskill Mountains and south to Hudson Highlands State Park. It’s the longest elevated pedestrian bridge in the world and an easy walk from the Poughkeepsie train station. Afterward, celebrate making it across by savoring delicious cheese samples and fresh homemade ice cream at Sprout Creek Farm, a working dairy that’s a short drive away. Don’t have a car? Dutchess County Tourism offers a Farm Fresh Tour in conjunction with Metro-North. Shuttle buses will pick you up from the train and transport you to nearby sights: a village for lunch, an orchard for apple picking, a sheep and wool farm for shopping or a local distillery or vineyard for a tasting. More of a walk than a hike, the relatively flat trail to Arden Point in Hudson Highlands State Park doesn’t gain a lot of elevation. 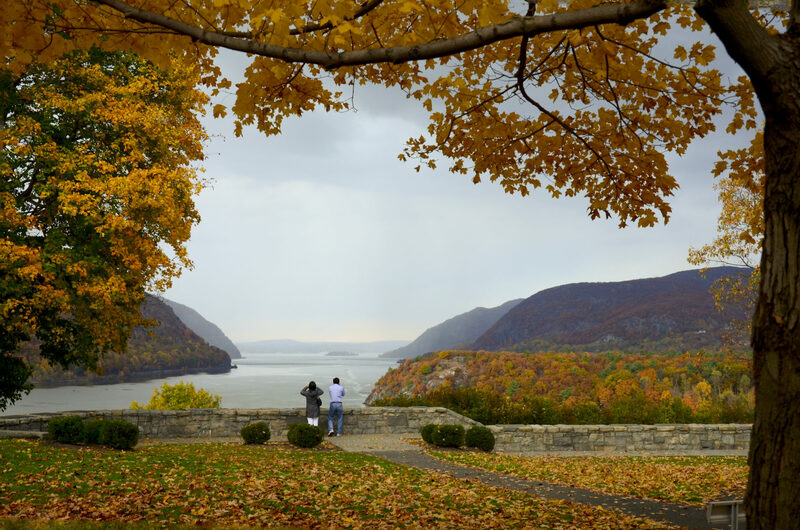 Instead, it takes you to the banks of the Hudson and boasts impressive views of the fortress-like West Point United States Military Academy. At the trailhead, you’ll notice colored discs (or blazes) affixed to the trees; follow these trail markers to make sure you’re heading in the right direction. From the Garrison train station, take the blue-blazed trail across the tracks to its intersection with a red-blazed trail that you can follow throughout the point. The path offers excellent views from several flat rock outcroppings or from a gazebo later down the line. If you go far enough, you’ll also come across the site of the dock Benedict Arnold used to flee American troops during the Revolutionary War. Then you can follow his escape route on old Beverly Dock Road. Don’t be confused by the New Jersey Transit train you’ll take to get to Harriman State Park; its miles of trails are all located in the southern tip of New York state. Take the wide, blue-blazed path for a leisurely walk in the woods or follow the white rectangles to join a section of the legendary Appalachian Trail. 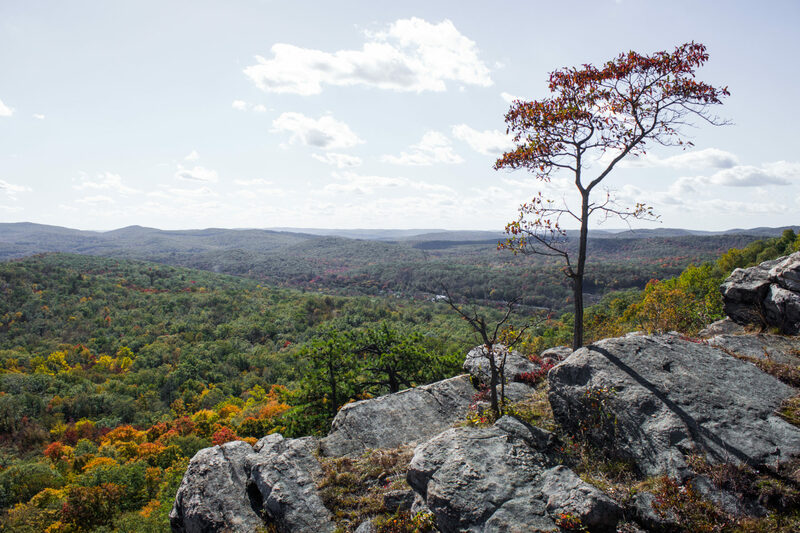 If you’re truly adventurous, tackle a section of Bear Mountain in adjacent Bear Mountain State Park. (Note: You’ll need to drive to get to that trailhead.) If you’re lucky, you’ll spot only a few other hikers on the sun-dappled trail and have the woods to yourself for most of the day. There are plenty of trails to choose from in Harriman State Park, and it can be easy to make a wrong turn. Be sure to pick up or download a trail map before you make the trip. If you’re riding the Metro-North Hudson Line north on a fall weekend morning, don’t be surprised if your train car empties out at Cold Spring. 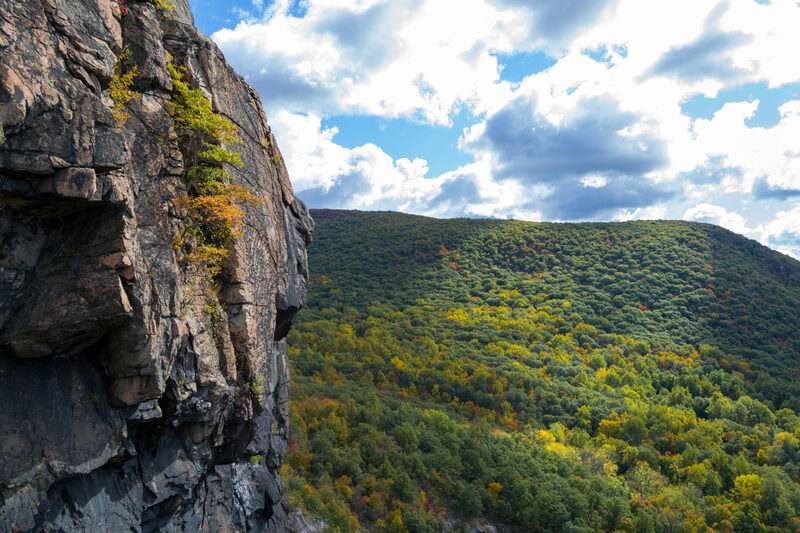 This popular stop for leaf-peeping hikers offers both the Breakneck Ridge trail (a seriously challenging endeavor, complete with some rock scrambling) as well as the Bull Hill hike, which offers spectacular vistas despite its slightly less-steep grades. Post-hike, reward yourself with a stroll along the beach at Little Stony Point and stop at one of the cute cafes on the main street for a well-earned bite to eat. Don’t take the “Mount” in Mount Beacon lightly. You will definitely feel like you climbed a mountain at the end of a day, but it’s well worth it for the sweeping views. The trailhead is a short cab ride from the train station. Once you get there, you will ascend roughly 200 stairs before following a steep trail up to the ruins of an old casino overlooking the Hudson. There’s a great ridge there for soaking in the views, or you can continue up to the old fire tower. The climb up the rickety steps isn’t for the faint of heart, but you’ll be rewarded with a view of fall foliage for miles across the rolling hills. Treat yourself to a stop at the excellent nearby Hudson Valley Brewery, a short walk from the trailhead, before you head back to the train — and the reality of New York City.